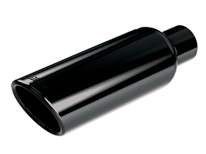 This unique Black Chrome tip stands out on any vehicle with a 2 3/4 tail pipe. Cleaner/Polish is not recommend for use on this finish. 2.75" Inlet- 4.00 Round Outlet Angle Cut with a Rolled edge 14" long Black Chrome finish. Gabe has the equipment/expanders to fix.